The sequel to 2005’s Batman Begins was not without its share of casting close calls, recasts, and drama. It would have been night and day different if just a few cards had been dealt differently. Bruce Wayne/Batman: Jake Gyllenhaal had been the second choice to play Batman in the 2005 Christopher Nolan reboot Batman Begins had Christian Bale backed out. Obviously, this didn’t happen, but if it did, it would have potentially changed a few things with The Dark Knight. For example, would his sister Maggie Gyllenhall would have still been cast as his love interest in The Dark Knight when Katie Holmes dropped out? Had Gyllenhaal played Bruce Wayne/Batman, would Heath Ledger still been cast as the Joker? 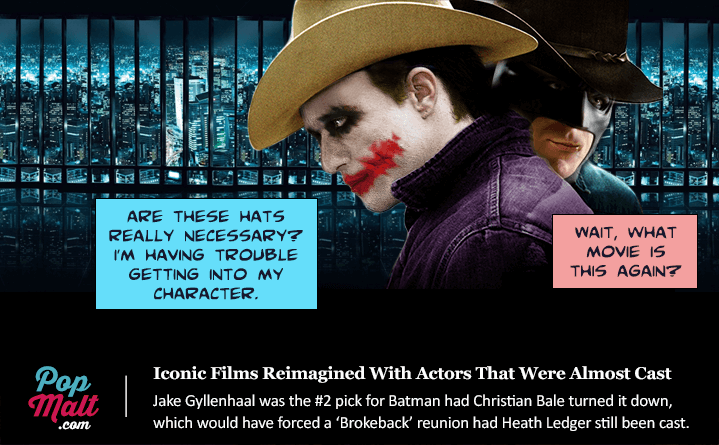 If so, then not only would the actors behind Batman and Rachel Dawes have been siblings, but the main two characters of the movie would have also been the main two characters from Brokeback Mountain, forcing an unofficial reunion of sorts. Harvey Dent/Two Face: After losing out to Bale as Batman in 2005, Jake Gyllenhall was back in line for a role in Nolan’s Batman world, and was considered for Harvey Dent, also in love with Rachel Dawes (which again, was a role given to his sister). Matt Damon was also in the running for Dent. The Joker: The Dark Knight gained legendary notoriety due to the untimely passing of its star Heath Ledger, which surrounded the film in media coverage late in production. While Heath’s performance was able to be preserved in the final edit, despite the fact that filming hadn’t been completed at the time of his death, he nearly didn’t end up in the film at all. Others who were considered eligible candidates for the role at various points in the production life cycle included the likes of Robin Williams, Adrien Brody, Sam Rockwell, and Paul Bettany, each of whom would have brought a completely different rendition of the character. Rachel Dawes: Katie Holmes was supposed to resume her Batman Begins role as Rachel Dawes in The Dark Knight, but cited scheduling conflicts, electing to shoot Mad Money instead. Abbie Cornish was considered, along with Maggie Gyllenhall, who got the part.